From 25 May 2018, the EU General Data Protection Regulation (GDPR) will affect every organisation that processes EU residents’ personally identifiable information (PII). Non-compliance with GDPR could be catastrophic – in terms of fines and reputational damage - however, non-compliance could also mean a significant loss of competitive advantage. 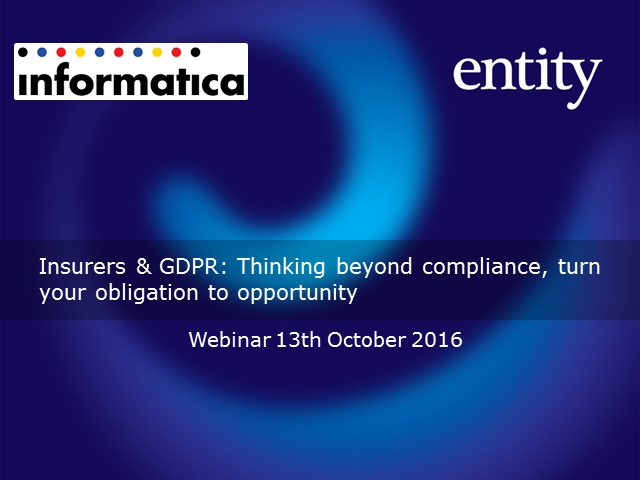 This webinar explores the strategic impact GDPR will have across insurance organisations and their data landscapes. In reality, GDPR is a clarion call for treating data as a strategic asset – and affects all of us, regardless of whether you are a Chief Data Officer, Head of Risk/Legal or a CMO.